This is part of a sponsored collaboration with Latina Mom Bloggers and Old Spice. All opinions are 100% mine. I don't have sons, so I was never blessed with knowing much about the world of boys and young men. But now I do have 4 grandsons and the oldest is about to be a pre-teen! Time flies so fast, I still remember when he was a baby, and it seems just like yesterday. When did he start to turn into a young man? It's hard for me to imagine him in a few years when he becomes a teen. That's when he won't want to hang out with the boring chicks anymore and will probably be embarrassed to be seen with us. I love all my grandkids, but it is very hard to see them grow up so fast. Manhood is right around the corner for this little guy! Smellcome to Manhood is a campaign from Old Spice that encourages young boys to embrace manhood by smelling just like the men in their lives. Old Spice is one of those scents that even I, a girl, remember from my youth and I know how boys love to smell like the men in their lives. For the holidays they have released a very fun song, "Dad Song" which celebrates the turmoil that both moms and dads go through as their young boys get older. Moms want their little boys to stay little boys and never grow up, while dads want their boys to grow up and be manly. This holiday season, giving the gift of manhood couldn't be easier with Old Spice Re-fresh Body Spray, featuring the brand's innovative and first-in-category Re-fresh Technology, which eliminates the need for guys to overspray or reapply throughout the day. With Old Spice Re-fresh Body Spray, “One Spray Lasts All Day.” I have two teen nephews so I do know about the over-scenting issue...lol. Old Spice Re-fresh Body Sprays are the perfect stocking stuffer. Teens can “Scent Responsibly”with this gift that keeps on giving, one spray at a time. You bet they are going to be getting some of these in those boys stockings! 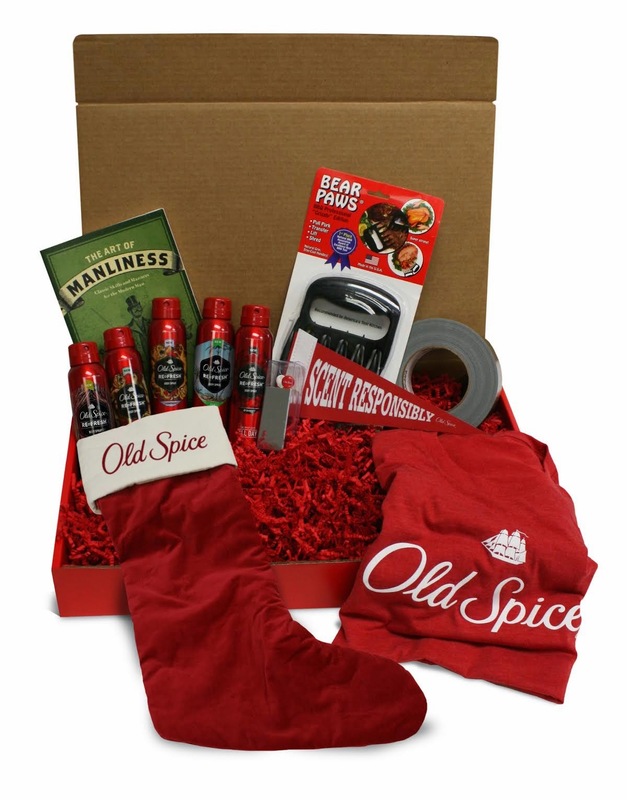 And right now you can save $1 on each bottle you purchase using this Old Spice coupon on coupons.com. Old Spice – a holiday gifting tradition passed on from grandfathers to dads to sons for more than 75 years – is proud to be partnering with Second Chance Toys for the HoliSPRAY Toy Donation Exchange! The inaugural Old Spice HoliSPRAY Toy Donation Exchange runs from Dec. 3 through Dec. 15 and in exchange for gently used toys, Old Spice will be gifting them with Re-fresh Body Spray in exchange for your donation. This holiday season it's easy to give the gift of manhood, and with the coupon save some money as well. Today I also have a really great giveaway that is sure to welcome one young man into manhood! Check out the super prize! 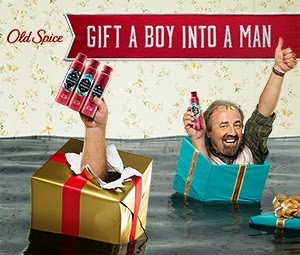 Old Spice Re-fresh Body Spray – The gift that keeps on giving, one spray at a time. 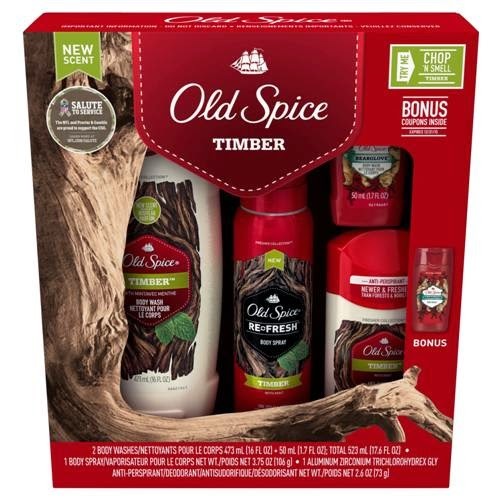 Be the first to enjoy new Old Spice Timber – the best way to get that lumberjacky smell without working at a local tree lot. Old Spice T-Shirt – The manliest chest tattoo on the planet without the regret when you turn 60. Old Spice Branded Earbuds – Silence mom’s singing in the car. You’re welcome. Bear Paws Meat Tool – Cutlery your dad, his friend Dave and Uncle John will be impressed with when you're given the reins to carve the holiday bird. Duct Tape – Fix anything on the planet, except holiday lights, where only half the strand works. Art of Manliness Book – Full of wisdom and New Year's Resolutions. “Scent Responsibly” Instructions – Nothing will earn you grandma's fruitcake faster than overspraying. Thanks to Old Spice Re-fresh technology – where one spray lasts all day – you can smell like a man and not a middle school locker room. Smellcome to Manhood Certificate – A made-up diploma for the inside of your locker or to add to your LinkedIn profile. Enter between now and December 15th for your chance to win!